Definition of adjudicating authority to exclude National Anti– Profiteering Authority. Modification in the definition of Cost Accountant. ITC availability on Schedule III items. Issue of consolidated credit note in a financial year. Issue of consolidated debit note in a financial year. Accounts to be audited for specified class of registered person. Ceiling limit for pre deposit for filing appeal before Appellate Authority. 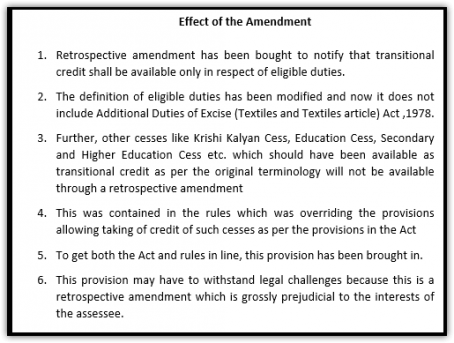 Retrospective amendment in the transitional credit. Ceiling limit introduced for filing appeal before Appellate Authority and Appellate Tribunal. Clause 2(a)(ii) of the CGST Amendment Act, 2018. Date to be notified by the government. Section 2(4) of the CGST Act, 2017. 2. Modification in the clause relating to race club in the definition of Business. 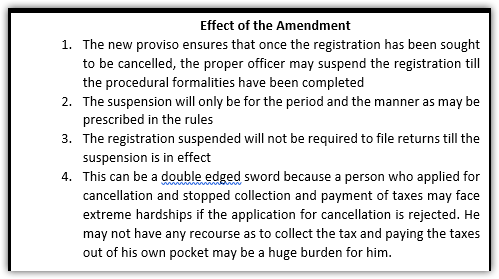 Clause 2(b) of the CGST Amendment Act, 2018. Section 2(17) (h) of the CGST Act, 2017. The above provision marked in red has been substituted by provisions marked in green. 3. in the definition of Cost Accountant. Clause 2(d) of the CGST Amendment Act, 2018. The above provision marked in red has been substituted with the provision marked in green. Clause 2(e) of the CGST Amendment Act, 2018. Article 371J has been included in the definition of local authority. Clause 2(c) of the CGST Amendment Act, 2018. Clause 2(f) of the CGST Amendment Act, 2018. Explanation-For the removal of doubts, it is hereby clarified that the expression “services” includes facilitating or arranging transactions in securities. The portion marked in green has been inserted. Clause 3 of the CGST Amendment Act, 2018. Section 7 of the CGST Act, 2017. (1A) Certain activities or transactions, when constituting a supply in accordance with the provisions of sub-section (1), shall be treated either as supply of goods or supply of services as referred to in Schedule II. Clause 30 of the CGST Amendment Act, 2018. The portion marked in red has been omitted. Clause 32 of the CGST Amendment Act, 2018. Supply of goods from a place in the non-taxable territory to another place in the non-taxable territory without such goods entering into the taxable territory. 8 (a) Supply of warehoused goods to any person before clearance for home consumption. 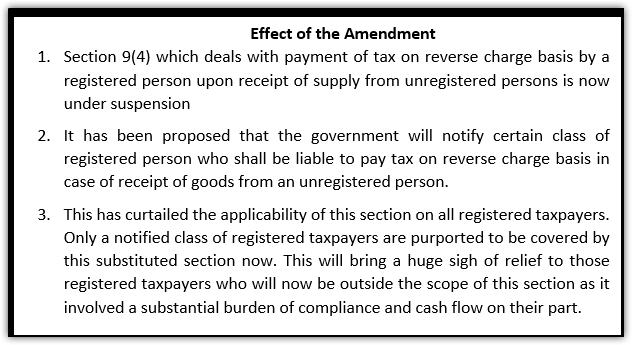 Clause 4 of the CGST Amendment Act, 2018.
reverse charge basis as the recipient and all the provisions of this Act shall apply to such recipient as if he is the person liable for paying the tax in relation to the supply of such goods or services or both. 9(4) The Government may, on the recommendations of the Council, by notification, specify a class of registered persons who shall, in respect of taxable goods or services or both received from an unregistered supplier, pay the tax on reverse charge basis as the recipient of such goods or services or both, and all the provisions of this Act shall apply to such recipient as if he is the person liable for paying the tax in relation to the supply of such goods or services or both. The provision marked in red has been substituted by the provisions marked in green. Clause 5 of the CGST Amendment Act, 2018. Provided that the Government may, by notification, increase the said limit of fifty lakh rupees to such higher amount, not exceeding one hundred and fifty lakhs rupees, as may be recommended by the Council. Provided further that a person who opts to pay tax under clause (a), clause (b) or clause (c) may supply services of value not exceeding ten percent of turnover in the preceding financial year in a State or Union territory or five lakh rupees, whichever is higher. Clause 6 and Clause 7 of the CGST Amendment Act, 2018. 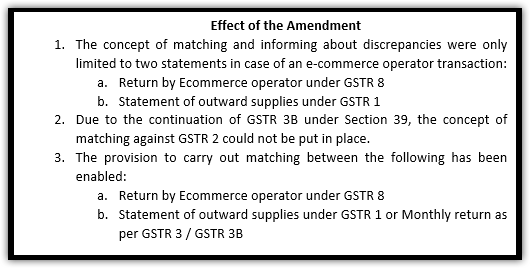 Clause 8(a) of the CGST Amendment Act, 2018. 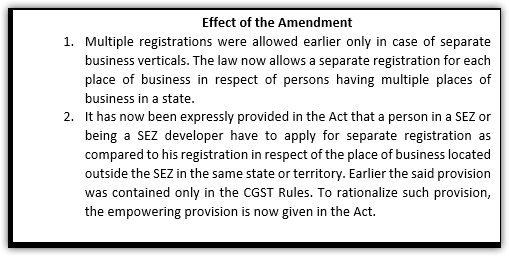 Clause 8(b) of the CGST Amendment Act, 2018. 15. ITC availability on Schedule III items. 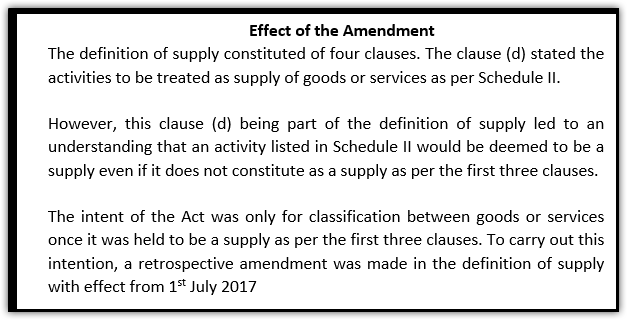 Clause 9(a) of the CGST Amendment Act, 2018. 17 (3) The value of exempt supply under sub-section (2) shall be such as may be prescribed, and shall include supplies on which the recipient is liable to pay tax on reverse charge basis, transactions in securities, sale of land and, subject to clause (b) of paragraph 5 of Schedule II, sale of building but shall not include the value of activities or transactions (other than sale of land and, subject to clause (b) of paragraph 5 of Schedule II, sale of building) specified in Schedule III. 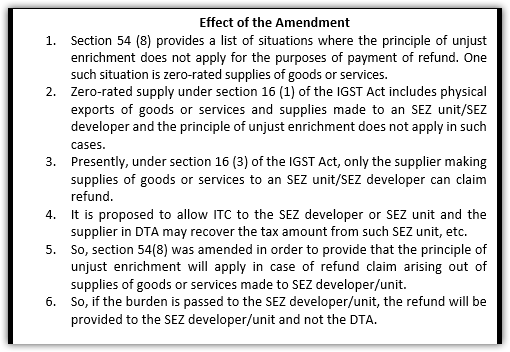 Clause 9(b) of the CGST Amendment Act, 2018. Provided that the input tax credit in respect of such goods or services or both shall be available, where the provision of such goods or services or both is obligatory for an employer to provide to its employees under any law for the time being in force. Clause 10 of the CGST Amendment Act, 2018. Clause (c) of Explanation to section 20: the term ‘turnover’, in relation to any registered person engaged in the supply of taxable goods as well as goods not taxable under this Act, means the value of turnover, reduced by the amount of any duty or tax levied under entries 84 and 92A of List I of the Seventh Schedule to the Constitution and entries 51 and 54 of List II of the said Schedule. Clause 11 of the CGST Amendment Act, 2018. Clause 12 of the CGST Amendment Act, 2018. The provision marked in green has been inserted. Clause 13 of the CGST Amendment Act, 2018. Clause 14 of the CGST Amendment Act, 2018. 23. Issue of consolidated credit note in a financial year. Clause 15(a) of the CGST Amendment Act, 2018. 34(1). Where a tax invoice has been issued for supply of any goods or services or both and the taxable value or tax charged in that tax invoice is found to exceed the taxable value or tax payable in respect of such supply, or where the goods supplied are returned by the recipient, or where goods or services or both supplied are found to be deficient, the registered person, who has supplied such goods or services or both, may issue to the recipient a credit note containing such particulars as may be prescribed. 34(1). Where one or more tax invoice have been issued for supply of any goods or services or both and the taxable value or tax charged in that invoice is found to exceed the taxable value or tax payable in respect of such supply, or where the goods supplied are returned by the recipient, or where goods or services or both supplied are found to be deficient, the registered person, who has supplied such goods or services or both, may issue to the recipient one or more credit notes for supplies made in a financial year containing such particulars as may be prescribed. The portion marked in red has been substituted with the portions marked in green. 24. Issue of consolidated debit note in a financial year. 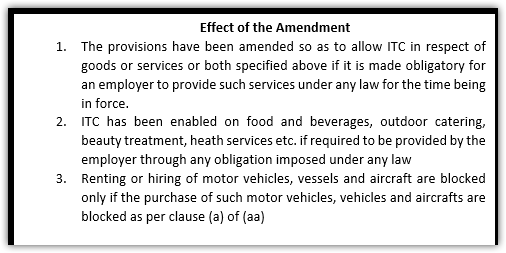 Clause 15(b) of the CGST Amendment Act, 2018. 25. Accounts to be audited for specified class of registered person. Clause 16 of the CGST Amendment Act, 2018. Section 35(5) of the CGST Act 2017. 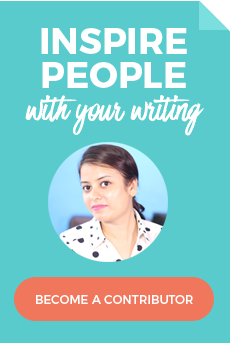 Every registered person whose turnover during a financial year exceeds the prescribed limit shall get his accounts audited by a chartered accountant or a cost accountant and shall submit a copy of the audited annual accounts, the reconciliation statement under sub-section (2) of section 44 and such other documents in such form and manner as may be prescribed. Provided that nothing contained in this sub-section shall apply to any department of the Central Government or a State Government or a local authority, whose books of accounts are subject to audit by the Comptroller and Auditor-General of India or an auditor appointed for auditing the accounts of local authorities under any law for the time being in force. Provided that where the Appellate Authority is satisfied that the appellant was prevented by sufficient cause from presenting the appeal within the period so specified, it may allow a further period of thirty days for filing such appeal. Clause 17(a) of the CGST Amendment Act, 2018. Every registered person, other than an Input Service Distributor or a non-resident taxable person or a person paying tax under the provisions of section 10 or section 51 or section 52 shall, for every calendar month or part thereof, furnish, in such form and manner as may be prescribed, a return, electronically, of inward and outward supplies of goods or services or both, input tax credit availed, tax payable, tax paid and such other particulars as may be prescribed, on or before the twentieth day of the month succeeding such calendar month or part thereof. Every registered person, other than an Input Service Distributor or a non-resident taxable person or a person paying tax under the provisions of section 10 or section 51 or section 52 shall, for every calendar month or part thereof, furnish, in such form, manner and within such time as may be prescribed, a return, electronically, of inward and outward supplies of goods or services or both, input tax credit availed, tax payable, tax paid and such other particulars as may be prescribed. Clause 17(b) of the CGST Amendment Act, 2018. Clause 17(c) of the CGST Amendment Act, 2018. 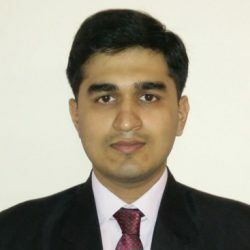 Provided that no such rectification of any omission or incorrect particulars shall be allowed after the due date for furnishing of return for the month of September or second quarter following the end of the financial year, or the actual date of furnishing of relevant annual return, whichever is earlier. Provided that no such rectification of any omission or incorrect particulars shall be allowed after the due date for furnishing of return for the month of September or second quarter following the end of the financial year to which such details pertain, or the actual date of furnishing of relevant annual return, whichever is earlier. Clause 18 of the CGST Amendment Act, 2018. (1) Notwithstanding anything contained in section 37 or section 38, the procedure for furnishing the details of outward supplies by a registered person, other than an Input Service Distributor or a non-resident taxable person or a person paying tax under the provisions of section 10 or section 51 or section 52 (hereafter in this section referred to as the ‘supplier’), and for verifying, validating, modifying or deleting such supplies by the corresponding registered person (hereafter in this section referred to as the ‘recipient’) in connection with the furnishing of return under section 39 shall be such as may be prescribed..
(vii) the procedure, safeguards and threshold of tax amounts in the invoices, the details of which can be furnished under clause (i) by a newly registered person or by a registered person who has defaulted in payment of tax liability, exceeding the amount of tax or the period of time specified in the rules. Clause 19 of the CGST Amendment Act, 2018. Clause 21 of the CGST Amendment Act, 2018. Provided that input tax credit on account of central tax, State tax or Union territory tax shall be utilised towards payment of integrated tax under clause (b), clause (c) or clause (d) only after the input tax credit available on account of integrated tax has been first utilised fully towards such payment. Section 49A. Notwithstanding anything contained in section 49, the input tax credit on account of central tax, State tax or Union territory tax shall be utilised towards payment of integrated tax, central tax, State tax or Union territory tax, as the case may be, only after the input tax credit available on account of integrated tax has first been utilised fully towards such payment. Section 49B. 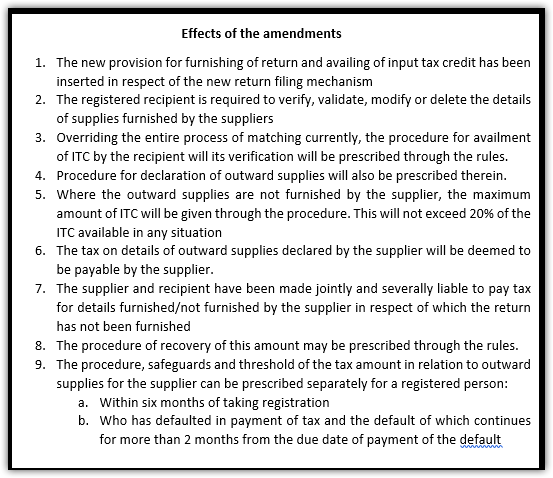 Notwithstanding anything contained in this Chapter and subject to the provisions of clause (e) and clause (f) of sub-section (5) of section 49, the Government may, on the recommendations of the Council, prescribe the order and manner of utilisation of the input tax credit on account of integrated tax, central tax, State tax or Union territory tax, as the case may be, towards payment of any such tax.”. 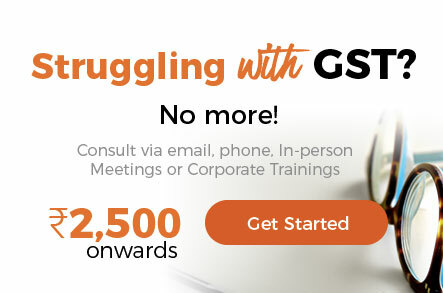 Section 52(9) of the CGST Act, 2018. 52(9). Where the details of outward supplies furnished by the operator under sub-section (4) do not match with the corresponding details furnished by the supplier under section 37 or section 39, the discrepancy shall be communicated to both persons in such manner and within such time as may be prescribed. Clause 23(b)(ii) of the CGST Amendment Act, 2018. Clause 23(a) of the CGST Amendment Act, 2018. The portion marked in red has been substituted by the portion marked in green. Clause 23(b)(i) of the CGST Amendment Act, 2018. Clause 24 of the CGST Amendment Act, 2018. (1) For the purposes of this section, the word person shall include “distinct persons” as referred to in sub-section (4) or, as the case may be, sub-section (5) of section 25. (2) For the purposes of this clause, the term “Collector” means the Collector of a revenue district and includes a Deputy Commissioner or a district magistrate or head of the revenue administration in a revenue district. 37. Ceiling limit for pre deposit for filing appeal before Appellate Authority. Clause 25 of the CGST Amendment Act, 2018. (a) in full, such part of the amount of tax, interest, fine, fee and penalty arising from the impugned order, as is admitted by him; and. (b) a sum equal to ten per cent. of the remaining amount of tax in dispute arising from the said order, subject to a maximum of twenty-five crore rupees, in relation to which the appeal has been filed. (b) a sum equal to twenty per cent. of the remaining amount of tax in dispute, in addition to the amount paid under sub-section (6) of section 107, arising from the said order, subject to a maximum of fifty crore rupees, in relation to which the appeal has been filed. Clause 27 of the CGST Amendment Act, 2018. 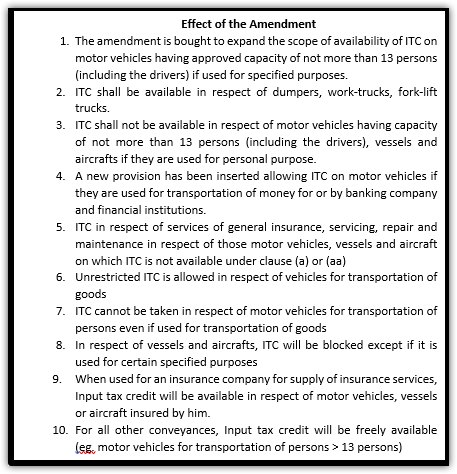 Section 129(6) of the CGST Act, 2018. Provided that where the detained or seized goods are perishable or hazardous in nature or are likely to depreciate in value with passage of time, the said period of fourteen days may be reduced by the proper officer. 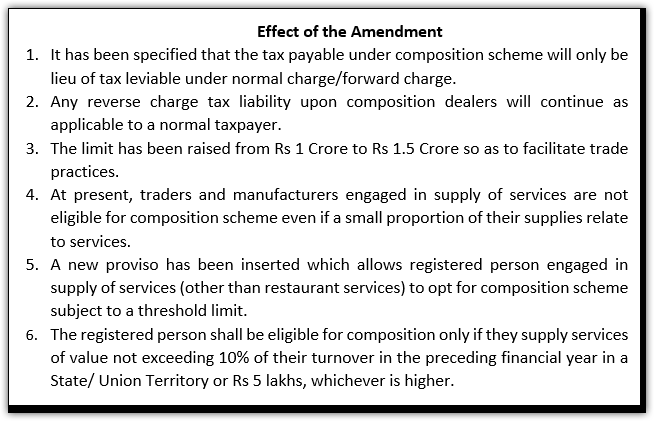 Explanation 1 (iii) and (iv) of the CGST Act, 2018. 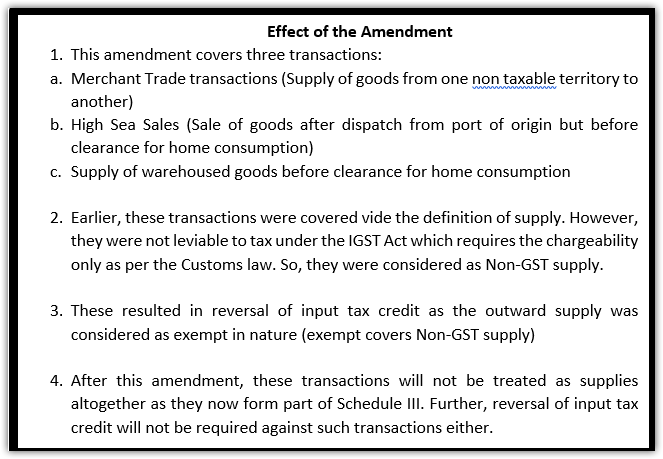 Explanation 2 clause (iii) and (iv) of the CGST Act, 2018. 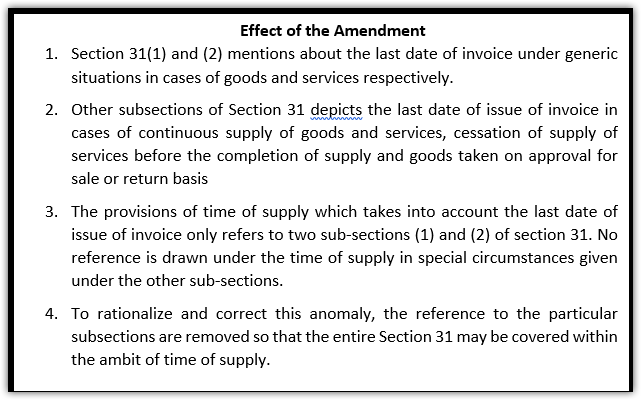 Explanation 3 – For removal of doubts, it is hereby clarified that the expression “eligible duties and taxes” excludes any cess which has not been specified in Explanation 1 or Explanation 2 and any cess which is collected as additional duty of customs under sub- section (1) of section 3 of the Customs Tariff Act, 1975. Clause 31 of the CGST Amendment Act, 2018. Schedule II of the CGST Act, 2017. (v) the supplier of service and the recipient of service are not merely establishments of a distinct person in accordance with Explanation 1 in section 8;. established by any Government, with ninety per cent. or more participation by way of equity or control, to carry out any function entrusted to a Panchayat under article 243G or to a municipality under article 243W of the Constitution”. 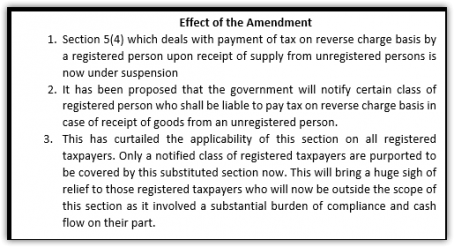 Clause 3 of the IGST Amendment Act, 2018.
a supplier, who is not registered, to a registered person shall be paid by such person on reverse charge basis as the recipient and all the provisions of this Act shall apply to such recipient as if he is the person liable for paying the tax in relation to the supply of such goods or services or both. 5(4) The Government may, on the recommendations of the Council, by notification, specify a class of registered persons who shall, in respect of supply of specified categories of goods or services or both received from an unregistered supplier, pay the tax on reverse charge basis as the recipient of such supply of goods or services or both, and all the provisions of this Act shall apply to such recipient as if he is the person liable for paying the tax in relation to such supply of goods or services or both. Clause 4 of the IGST Amendment Act, 2018. (b) a person other than a registered person, shall be the location at which such goods are handed over for their transportation:. Provided that if the transportation of goods is to a place outside India, the place of supply shall be the place of destination of such goods. 50. Ceiling limit introduced for filing appeal before Appellate Authority and Appellate Tribunal. Clause 8 of the IGST Amendment Act, 2018. Section 20 of the IGST Act, 2018.
revenue determined in accordance with the provisions of section 5.”. Section 9A and 9B of the UTGST Act, 2017. 9A. Notwithstanding anything contained in section 9, the input tax credit on account of Union territory tax shall be utilised towards payment of integrated tax or Union territory tax, as the case may be, only after the input tax credit available on account of integrated tax has first been utilised towards such payment. 9B. Notwithstanding anything contained in this Chapter and subject to the provisions of clause (c) of section 9, the Government may, on the recommendations of the Council, prescribe the order and manner of utilisation of the input tax credit on account of integrated tax, Central tax, State tax or Union territory tax, as the case may be, towards payment of any such tax.